Thank you for visiting Madison Dental Spa online! Dr. Moumen Almouzayn and our dental team look forward to providing all the members of your family with excellent dentistry in a rejuvenating environment. From basic dental care to the latest transformative services, we offer all the services you need to achieve the smile you have always wanted. Have you ever wondered what our patients say about their time with Dr. Moumen Almouzayn and our dental team? Then we invite you to read our reviews. We hope they will give you a better understanding of what you can expect at our dental office. At Madison Dental Spa, we are proud to offer you and your family high-quality dentistry in a soothing, relaxing environment. Our dentist and team offer a wide variety of treatments, including general, restorative, and cosmetic dentistry. Our team will work closely together with you, to create a customized treatment plan that will produce results you will love. At Madison Dental Spa, our entire dental team is committed to providing you and your entire family with comprehensive general and family dentistry. We care and coordinate for your family’s overall dental health, from initial visits to diagnosis, treatment, and follow-up care. General and family dentistry in Madison, Connecticut, is essential for lasting oral health. Our knowledgeable dental team at Madison Dental Spa is committed to helping you and your family receive the dental care you need while meeting your individual financial circumstances.When you visit our office for your first appointment, we will do our best to understand your smile and create a treatment plan suited to your needs. Welcome to Madison Dental Spa! 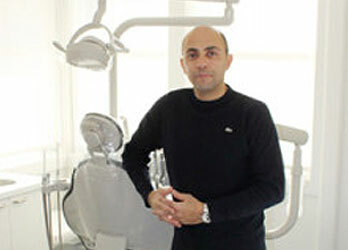 Led by Dr. Moumen Almouzayn, our dental team strives to offer you and your family the ultimate experience in dentistry. From routine dental cleanings and basic restorative care to the latest advances in cosmetic technology, we will help you reach all of your oral health needs and smile goals. At the heart of our practice is a commitment to excellence in dentistry and compassion in service. We work hard to have you always leave our office with renewed confidence and a smile. We are located in the heart of Madison, Connecticut, and have equipped our office with state-of-the-art technology while maintaining a warm, soothing atmosphere. Our goal is to ensure you have a positive, enjoyable time before, during, and after every visit with us. Our friendly dentist and dental team are excited to welcome you and your family to our office as we proudly serve Madison, Connecticut, and our surrounding communities, including Guilford, Clinton, Branford, New Haven, Old Saybrook, Westbrook, Chester, and Killingworth, Connecticut. If you would like to schedule a time to come and visit with Dr. Moumen Almouzayn and our team at Madison Dental Spa, we encourage you to call our office today. We would be happy to help you in any way we can. We look forward to caring for your smile! Do you find it hard to smile because of embarrassing dental flaws? Are you interested in improving the overall appearance of your smile? Then Dr. Moumen Almouzayn may suggest cosmetic dentistry. Dr. Moumen Almouzayn is highly skilled and experienced in many areas of dentistry, including oral surgery, periodontal care, and cosmetic treatments. When you visit our office for your first appointment, we will do our best to understand your smile and create a treatment plan suited to your needs.